In the heart of a vast woodland of oaks, the Picouty, camping in the Lot, rated 3 stars, has a capacity of 55 locations on 2.5 hectares. 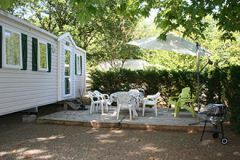 At your disposal in our campsite of multiple Mobil home and canvas bungalow all equipped. Come and discover our beautiful region, the valley of Dordogne, where multiple landscapes, historical and medieval sites await to amaze you. 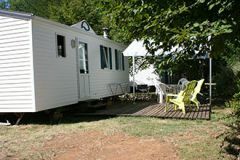 Camping in the Lot, The Picouty, welcomes you to Payrac in the Lot in an exceptional setting between Quercy and Perigord in the Dordogne valley. Our campsite, situated in Payrac, between the Quercy and the Périgord in the Dordogne valley, will enchant every family with our array of activities, set in an idyllic environment favourable to relaxation. 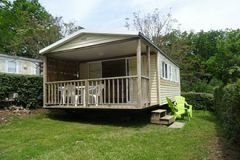 Multiple possibilities of comfortable mobile home rentals and canvassed bungalow rentals are at your disposable in a tree-filled park. 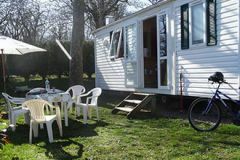 Our campsite offers different types of mobile homes and canvassed bungalows from those that will cover your basic needs to the more luxurious ones, the rentals can welcome from 2 to 6 people and have 2 to 3 bedrooms. 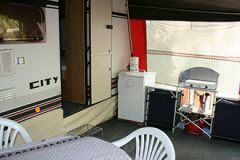 The spots allocated to camping and caravanning are spacious and comfortable. Multiple activities that will enchant the young as well as the old, from the vast swimming pool to the evening entertainment on offer during the whole course of the season, to create unforgettable memories. 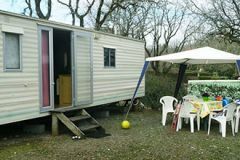 The campsite website offers you the possibility to consult the availability of the mobile home and the canvassed bungalow rentals as well as the hire of tents and caravan, but also the available spots for your tents and camper vans in out 3 star campsite, and offers the possibility to book online. Sylvie and Christian welcome you in their new found home, the Lot department in the Payrac, at the heart of the Dordogne valley. In a natural and remarkably historical environment, you will discover a warm and unique way of life. Our campsite in the Dordogne valley offers rentals and camping spots in an ideal setting for your family or even amongst friends. The Dordogne valley, the Quercy and the Périgord are strong tempered regions. You will be able to admire magnificent landscapes, areas remarkable by their diversity, varied physical and cultural activities, theme parks, calm and simplicity, and all the latter in the sunshine. Welcome to Payrac, at the heart of the Périgord and the Quercy, where the regional nature park “Les Causse du Quercy” begins. Overlooking the Dordogne valley, situated between the prestigious areas of Lot and of Dordogne : Rocamadour, the Abyss of Padirac, the Lascaux cave, Lacave, Gramat, Souillac … Payrac, small village, easily accessible by the D820 or the A20, enjoys the use of all the nearby trades such as: a small supermarket, a corner shop, a pharmacy, a bakery, a post office. In all simplicity you will share unforgettable moments in our campsite in the beautiful Lot region. Our campsite offers you the possibility to access the Payrac village by a small path, thus leaving your vehicle at the campsite and making the most of our very natural landscape in our beautiful Lot region. Accessing the campsite is easily done, as you exit Payrac coming from Gourdon (from the south) or as you enter Payrac coming from Souillac (from the north). Let us discover together this little slice of paradise and be apart of its story during simple, heart-warming holidays, in our pretty Lot region, between the Quercy and Périgord in the Dordogne valley. We also have accessible toilets, and the entrance is on a hill with a gravel road but easily accessible. 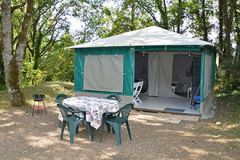 To access this page, you typed: Lot campsites, Dordogne valley campsites, campsites near Rocamadour, campsites near Souillac, campsites near Gourdon, family campsites in the Lot, campsites in the Périgord.